It’s almost back to school time! Whether it’s first year or the last – packing for the next school year ahead is upon us. And no matter how many roommates can pile into one residence, you have to make sure the place stays clean. But don’t take your mom’s ENJO – you gotta get your own. 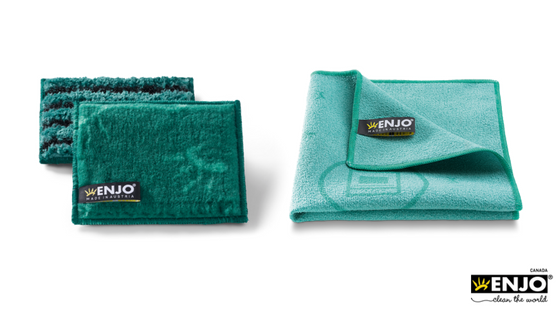 A combination of ENJO Zones will ensure your personal areas and belongings are kept clean from September to April. Introducing the ENJO Dorm Room Pack: two Zones simplified to keep you tidy through classes without the added stress or spending. Who can afford to keep on top of cleaning products on a student budget anyhow? 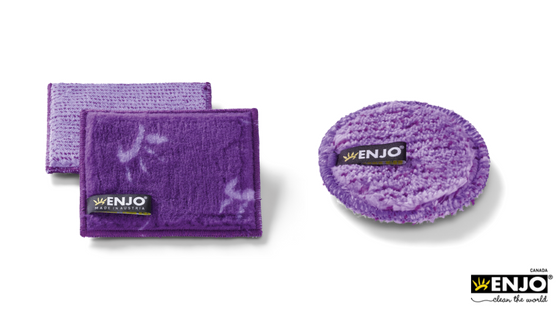 ENJO does the work for you, with no chemical use needed. Simply wet, wipe, and dry! The Zones featured in the Dorm Room Pack are Kitchen and Bathroom. All the essentials you need for your home away from home while you’re studying can be found here. If you’ve ever lived alone or with a few roommates, you know the kitchen can get very messy very quickly. Typically, everyone takes responsibility for their own spills and dirty dishes. Cleaning around counters and stovetops with the ENJO Kitchen Duocloth and ENJOfil saves you so much more time to clean up the aftermath of cooking catastrophes – time you should be using for studying, that is. Bathrooms are another story, as there can be as many as four people sharing one bathroom when you’re away at college or university. The Bathroom Duocloth and ENJOfil save the day as the perfect, quick cleaning method at your fingertips. This powerful tag team is great for all surfaces in the bathroom and will you get you in and out of there in only a few minutes. Time, money and space is important to save on especially as a student living away from home, and this is what ENJO offers you with the Dorm Room Pack. Don’t forget about skincare – something that is super important to take care of, especially under the stress of midterms and finals, and also a great pairing to our Dorm Room Pack. With the powerful, makeup removing action of our ENJO Eyepad, you’ll be able to go from all-day makeup wear right to your bed in only about a minute. You can also ditch those pricey toners and oil removers, allowing you to save money and also stay minimal when storing your belongings in the bathroom. The Body Duocloth is also an amazing companion in your skincare regimen for giving your skin an all over pore deep clean, which you might need after pulling a few all-nighters during the year.